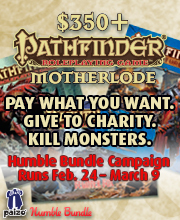 I was just looking at the Pathfinder Humble Bundle over at humblebundle.com and wow, what a deal. 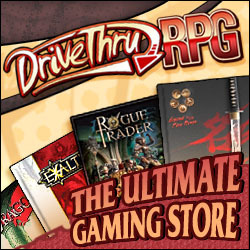 You can grab all the books you’ll ever need to play for a meager $18, and for $25 you’ll even get maps, dice and tokens. I can’t recommend this offer enough. Not only do you get to support a charity of your choice, but you’ll also be supporting a great publisher and an excellent initiative.